As will have been apparent I’m not really a blogger: lexicographic work doesn’t have frequent exciting leaps forward — hence Sam Johnson’s ‘Harmleſs Drudge’ quip. But I am now trying to make the distinction between this blog and the technical website where I make available the dictionaries and some of my related linguistic studies : Aardvarks Lexico. A schematic diagram summarising this long, rambling post can be seen here. I have reached a pause-point in the editing of the Mampruli Dictionary and this seems a stage where I might put the the whole enterprise in context. When I went to Ghana Joe Grimes was leading a workshop on Discourse, based on his book ‘The Thread of Discourse’ Thread of Discourse. While in Ghana Grimes was also collecting word-lists of vocabulary in the Ghana languages in connection with an ahead-of-its-time project for a comparative database of the languages of the world. The plan was to use the data from Summer Institute of Linguistics researchers round the world and the computer facility of the University of Oklahoma (remember that at that time ‘a computer’ filled a 4-storey building and had about the computing power of the non-smart phone in your pocket). Joe was working on algorithms to make it possible to compare vocabulary items by phonetic template, grammatical function and/or meaning, pairwise or in subsets of languages. After he left Grimes wrote (no phones or e-mails in those days, folks!) to ask me to collect more and better wordlists of the Ghana languages as the samples available off-the-peg in 1973 were very tentative preliminary survey data. Having started collecting, I then heard that the project fell through for lack of funding, but I had already invested some time and got hooked on the interest of comparative lexicography. Meanwhile we had received our primary assignment, to study and help in the development of the Mampruli language (1974) and settled in the village of Gbeduuri in the Northern Region of Ghana. On the basis of these earlier studies, I made a focus on the Western Oti-Volta subgroup of these languages which includes Mampruli and many of the neighbouring tongues. 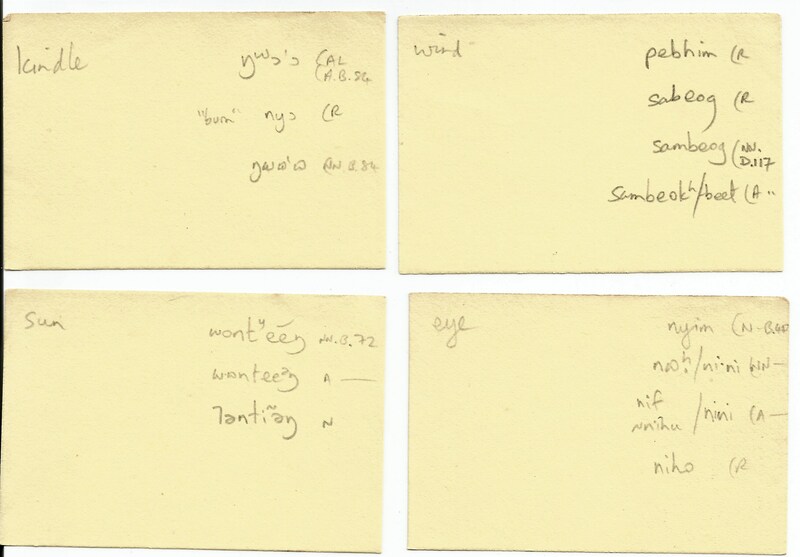 My main field dictionary of Mampruli was built up as I and my colleagues (primarily Margaret Langdon in 1974-6 and Tony Pope from 1977-82) worked on the language, on 6 x 4″ light cards, written in pencil and filed in the then-iconic shoeboxes, see facsimile card . In odd moments of time I was also collecting entries into a series of mini slip-files, paper slips 3 x 2″. (Arthur Hokett, neighbouring Texan missionary of the Assemblies of God Church, had off-cut strips from reducing the USA-sized paper he had brought from home to the imperial sizes then standard in Ghana). You can see instances of these little slips : facsimile slips . KaMara, Hanga, Mampruli, Dagbani, Nanun, Talni, Nabit, Kusaal (Toende), Kusaal (Agole), Mõõré, Nõõtré, Farefare, Ninkããré, Waali, Dagaari, Birifor, Safaliba. I also collected data in closely-related Oti-Volta language Buli and, when it was ‘discovered’, Kɔnni . At an even later stage Kantoosi was added to the list of W.O/V (at the beginning of the above list). The concept which I developed as a goal was a comparative dictionary of these languages, primarily keyed to a concept and arranged semantically – thus an entry showing the word for ‘sun’ in all the languages would be grouped with an entry for ‘moon’ and one for ‘star’, and so on. Reference to individual concepts would be facilitated by an alphabetic index. I have made a sample entry to show the idea. For the semantic keys I developed a Thesaurus based on work by Philip Hewer and originally published as a hard-copy booklet of keys referenced by English words and arranged in a semantic framework with letter and number indices. This looked like facsimile Thesaurus page. The items and thesaurus structure were partly based on our understanding of the vocabulary of the north-Ghanaian languages we were working on, and the hope was that with colleagues completing thesauri in the various languages the ‘emic’ nature of the schema could be refined (unfortunately this did not materialise through lack of take-up). As a comparative dictionary this approach would detect related (‘cognate’) words where the relationship was obscured in alphabetical wordlists because of slight semantic change in one language or another, or even just different glossing-choices by the investigators. In order to publicise the project and try to get data and collaboration from colleagues, I started producing ‘Lexinotes’ which exemplified, with commentary, entries for a group of concepts (such as words for ‘water-features’ [river, lake, well, swamp …]). I kept swinging to and fro between taking one word and finding it in wordlists of all the languages one by one, and compiling the comparative dictionary from the wordlists and extracting the individual entries ready-formed from that. Because progress on the different languages was patchy and time limited, I tended to use the first alternative for the Lexinotes and similar studies, but later on changed focus to the second option. The Lexinotes were duplicated piecemeal in a limited edition and mostly do not survive. Some digitalised examples can be seen on the website. 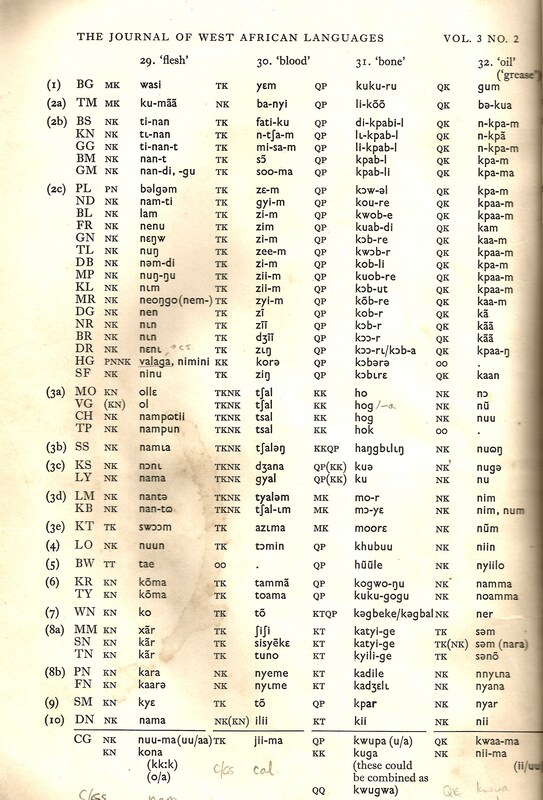 At the end of the 1970s Manessy published a comparative study of all the Central Gur languages [Manessy, Gabriel 1979. Contribution à la classification généalogique des langues voltaïques : – le proto-central. Paris : SELAF] . Over the next 30 years in dribs and drabs I made a manuscript compilation of all Manessy’s proto-forms, then a digital database, added my own less-firmly-based summary forms where Manessy’s data were inadequate, and finally a database keyed to the thesaurus headings from which relevant ‘etymologies’ could be added to the entries in the dictionaries of the individual languages and the comparative dictionary. An example can be seen in the comparative sample entry (in green). A major change in all of our lives came in the 1990s with the introduction of computers and digital processing. On the one hand this offered very powerful help to lexicographical work, in terms of making copies and backups of materials, safe from fire, flood and termites, and in facilitating alphabetisation, searching, cross-linking and other valuable tools. On the other hand for projects like mine which were already somehow advanced in manuscript form there was the prerequisite of keyboarding large swathes of data, with no advances possible until it was done. In my case I am still transcribing handwritten slips and cards from the best part of forty years ago. Also the rapid advances of computing meant that existing work had constantly to be updated and converted for new computer systems, applications, storage media and protocols. In order to maintain continuity/compatibility with material from earlier phases of the project I have to maintain formats which were designed to cope with the inability of earlier hardware (processing, cacheing and file-storage limitations) and software (earlier applications or versions of applications) to handle multi-word items or items containing (certain sorts of) punctuation in sorting and linking tasks. The Unicode standard is an immense leap forward for all work in world languages, but again I am still finding myself referring to files which need to be converted from legacy ASCII work-arounds for the representation of the orthographies and phonetics of Ghanaian languages. The sample comparative dictionary entry drew some data from an earlier attempt which turned out to be in ‘Ghana Doulos’ ASCII font and needed manual conversion to integrate with the entry from the final (hopefully) database which I am currently using [whoops! just discovered there is already a unicode-converted version – such is life in this disorganised project!]. In this Brave New World the aim was to make lexical databases with the SIL ‘SHOEBOX’ application which is widely-used for this sort of work. The minimalist markup means that the data files can be read and edited in a plain text editor if need be. The programs designed to work with them allow the ordinary user to specify the display formatting, while geeks can readily make scripts to convert the basic form to other markup systems where required. Such time as was available for the dictionaries work (translation and publishing of Mampruli Scripture – first Luke’s Gospel, then Genesis-Exodus 20, finally the New Testament (2001) – was mainly devoted to keyboarding and converting manuscript texts and wordlists to usable digital forms. I received the TOOLBOX program, the new incarnation of SHOEBOX. The final version of the Dagbani Dictionary (as a table in MS WORD) was passed on to me. I was urged to carry the Dagbani lexicographic project further. By the time I had assimilated and converted to these new materials and goals, the Dagbani Bible and Fr. Kofi Ron Lange’s collection of Dagbani Proverbs were published (both 2006) and I had access to the electronic files of both, partly with a view to noting possible corrections for future editions. working through the Dagbani Bible and inserting examples from the text into the entries in the TOOLBOX dictionary database. adding thesaurus keys, lexical functions and other missing fields when an example was inserted in a record. refining the entry structures to make as easy as possible the entry and retrieval of the content that I felt was important. These principles were then intermittently used for other dictionary databases that came my way, most particularly Agole Kusaal, where I was acting as consultant to the Old Testament Translation team from 2001 to 2013. One aim which I have not yet fully implement was to produce a tailored set of ‘lexical functions’ less complex than those of Igor Meɫčuk and his collaborators, but more suited to my needs that those provided by the Multi-Dictionary Formatter of David Coward and Chuck Grimes [son of the Joe E. with whom this saga started] which works with the TOOLBOX program. During the latter part of this period I worked through the whole Dagbani database in alphabetical order bringing all the entries into uniformity with the finally-adopted format. With one or two side-excursions (producing a restricted-entry Mõõré dictionary in 2012, for instance) I completed this process by the end of 2014 and consider my involvement with the Dagbani effectively completed. The dictionary is published on the website. *REMINDER :: A schematic diagram summarising this long, rambling post can be seen here. Work on the Mampruli Dictionary has reached halfway (maari•2 “wetting”). This is 3500 fully-edited entries (some very long, some just cross-references [the figure is 2294 out of 5515 main entries]) out of a total so far of just over 6900 (so far — during editing some few are added and some few are removed). A further 1650 have had some editing done this year. It had to be divided into 5 parts because it has pictures and the file was too big to upload. Below you can see the partially-written introduction and samples of the beginning pages of both the Mampruli entries and the English index. 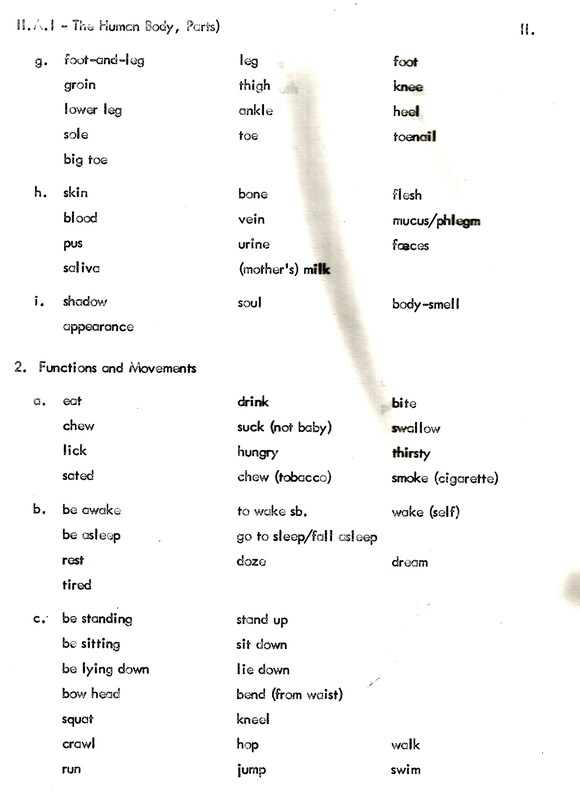 The Mampruli Dictionary In Electronic Form. Mampruli is one of the major languages of northern Ghana, with a significant number of first-language speakers (maybe around a quarter of a million or more). It is spoken in the north east quadrant of the Northern Region of Ghana. There are a number of anthropological studies of Mamprusi culture, notably those by Susan Drucker Brown (note that her linguistic material is not reliable). Very little formal lexical material was available in the earlier period apart from representation in wordlists and surveys (e.g. Swadesh et al. 1966). The ethnic group and its language were very much under the shadow of the much larger Dagomba / Dagban(l)i complex, although the head town of the original British Northern Territories protectorate was at Gambaga in Mampurugu. When I started work in the area I was given a typewritten wordlist by the medical missionaries of the Baptist Medical Center at Nalerigu which was a help in getting started. There was also the work of Swadesh, Arana and Drucker Brown which was a tour de force – a Mampruli-Spanish-English dictionary compiled in three weeks! Remarkable not for the fact that it was done well but that it was done at all. The present corpus is almost entirely based on my own work, even where items are also mentioned in other sources. Written resources include the New Testament and Plissart’s collection of proverbs (Plissart 1983) and Readers for the Mampruli literacy graduates published by Mamprint, Gbeduuri, and GILLBT, Tamale, 1982-2001. Major contributors were R.T.Abudulai, Salifu Philip Jangdow, Salifu Wundow and John Yakubu Takora. Status : as indicated above this is work in progress. Records or fields with a \nt field containing ?? are known to need further checking. From P to Z there has been much more improvement bringing in citations and other material from the main slip file. A-ŊM awaits this treatment. Other material also may be in need of correction or supplementation. The structure of entries still largely remains to be brought into the pattern which has been developed for the Dagbani dictionary view Dagbani. “Lost Marbles”, 31, Reading Road, Pangbourne, RG8 7HY, U.K.
Legal status : Many people have contributed to this work so we do not ‘own’ it in the sense of a book which we have written. On the other hand an enormous amount of our own work has gone into researching the forms and meanings and putting the materials into usable form. We therefore encourage you to use and share this material freely, and parts may be quoted for normal purposes of scholarly research and debate, with acknowledgement. No charge may be made for sharing this Dictionary or any publication which is based wholly or in part on this Dictionary without consulting me or ADLP at the above GILLBT address. Like most Ghanaian peoples, many Mamprusi nowadays live outside the traditional area, in the cities. The Mampruli or Ŋmampurili language is spoken in a broad belt across the northern parts of the Northern Region of Ghana, stretching west to east from Yizeesi to Nakpanduri and centred on the towns of Gambaga/Nalerigu and Walewale. The language belongs to the Gur family which is part of the great block of Niger-Congo languages which cover most of Africa south of the Sahara (Bendor-Samuel 1989). 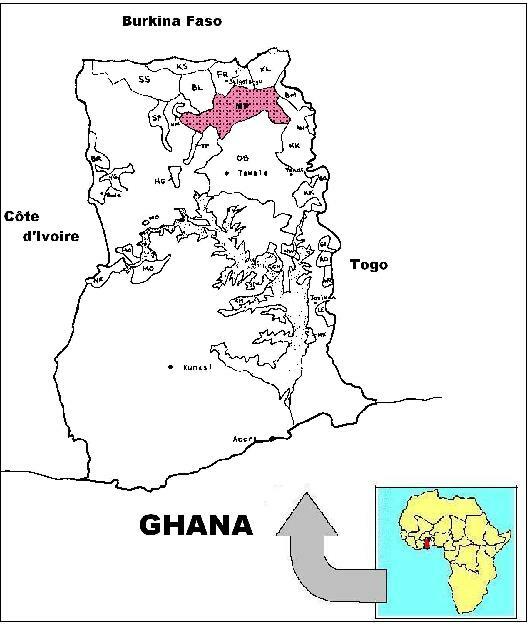 Within Gur it belongs to the Western Oti-Volta subgroup, and particularly its southeastern cluster of six to eight languages (Naden 1988, 1989). Closely-related and very similar languages spoken nearby are Dagbani, Nanun1, KaMara and Hanga, and Kusaal, Nabit and Talni in the Upper East Region. Not quite so closely-related are Farefare, Waali, Dagaari, Birifor and Safalaba in the Upper East and West Regions and southwest of the Northern Region. Most Ghanaians speak several languages, and many people of the Northern and Upper East regions can understand a little Mampruli or the closely-related Dagbani. As a group with a larger population some Mamprusi may only speak Mamprulii and one or more of the languages of wider communication Hausa, English or (Asante) Twi. Many others will know the language(s) of the neighbouring people who adjoin their own area or have settled near them in numbers. Government policy has varied over the years as to whether the local Ghanaian language should be extensively used in early education or whether ultimate performance in the international language will be enhanced by concentrating on English. The comparative lack of quantity and variety of literature, and of teachers trained in using the Ghanaian language, means that even when mother-tongue primary education is in favour it is difficult to teach it, and in it, effectively. Various agencies are involved in promoting adult literacy and related development issues, notably the Ghana Government’s Division (?) of Non-Formal Education, and the Mampruli Literacy Project of G.I.L.L.B.T. 1 The Nanumba people have more or less ceased using their own language and now speak eastern Dagbani with a distinctive accent. Naawuni Kunni Palli 2001: Mampruli New Testament. Tamale : GILLBT/WBT. Plissart, Xavier 1983. Mampruli Proverbs. Tervuren : Musée Royale de l’Afrique. 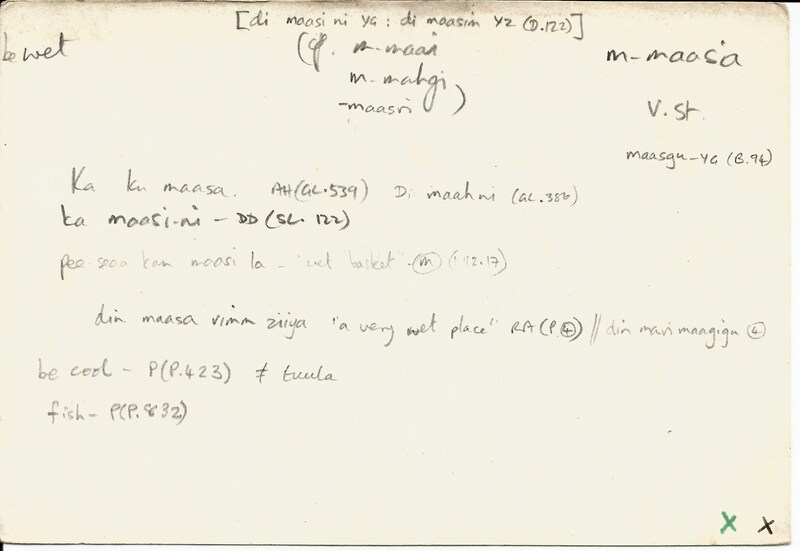 Plissart, Xavier 1970s Corpus of 4000 Mampruli Proverbs. 2 typescripts. About ⅔ published in Plissart 1983. Dakubu, Mary Esther Kropp [ed.] 1977. 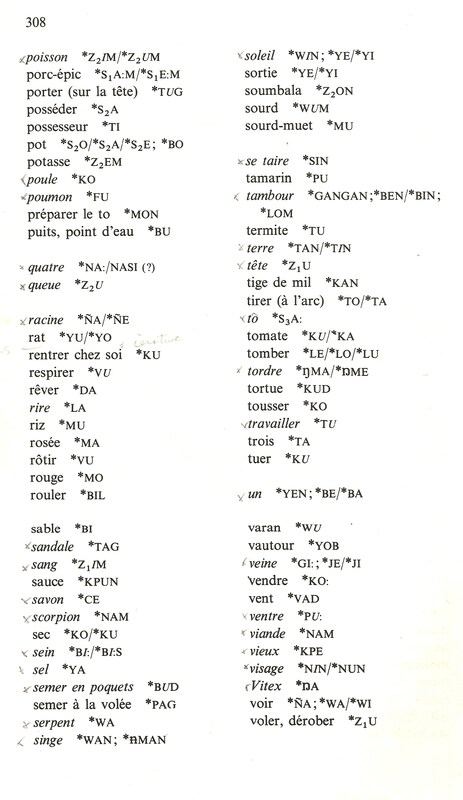 West African langage data sheets I. n/p : W.A.L.S. Dakubu, Mary Esther Kropp [ed.] 1988, The languages of Ghana. London : Kegan Paul International for I.A.I. /W.A.L.S. Davis, David C. 1979, Themes in the history of Dagbong and Mampurugu. unpub. – Northwestern Univ. Drucker Brown, Susan 1967. Mamprusi political organisation. Paris : CNRS-CRVS Colloque sur les cultures voltaïques. Dakubu,M.E.Kropp / S.Awinkene Atintono / E.Avea Nsoh [eds.] 2007. Gurenɛ-English Dictionary // English-Gurenɛ Glossary [2 Vols.] Legon : University of Ghana Linguistics Dept.